Quit reading my heart, Rose Cousins! Didja ever feel that way, when you listen to a song or album? That the songwriter has captured your situation, your feelings, exactly? And that you want to steal those lines, send them to the one you truly love, because you know they'll completely understand how you think, and hopefully they won't have heard, or will ever hear that album and know you didn't write them. Of course, such verses usually don't stand up to much scrutiny, and it's often just a couple of lines here and there that hit close to home. More than likely it's the mood the singer has tapped into that has you on the same wavelength. Whatever, Ms. Cousins has hit a nerve, and if you have a romantic bone in your body, or have felt the tiniest hurt, or unrequited love, watch out. This is the disc Cousins made down in "The Boston States" (as we used to call them here in the Maritimes), calling on her many musical friends she's made over the past decade appearing and collaborating in the New England songwriter community. Nothing against her Halifax peeps and scene, of course, and Cousins has made some fine music out of there, but this collection certainly has some added professional polish and gravitas. We are talking about an area that knows how to make modern-sounding singer-songwriter albums of course, and hearing Cousins backed by great players in a great studio sounding great, well, it makes the material shine more. The subtle harmonies, the choice of instruments that are just right, adding the best amount of shading, these are the tricks that make the difference. There's a short film on the interweb called If I Should Fall Behind, a documentary on the scene she's fallen in with, that will help explain all this. 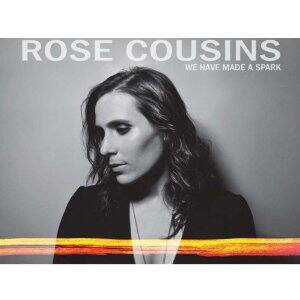 All good, but you have to have the songs, and this is Cousins' strongest collection of them to date. I dare say all of them could be stripped down to piano ballads and still leave me in a puddle, but then again I wouldn't want to miss, say, the soaring and mournful strings that are added to One Way, for instance, which is a solo piano piece until they arrive. Also, the tight playing perks several of the numbers up, such as the drum-led What I See. There's lots of tempo change, don't worry, those of you concerned about too much sensitivity. However, if you, like me, are inclined to wallow in it, I direct you to cut 6, Go First, where our narrator asks a lover and partner to be the first to break things up: "I need you to leave/I'm not the one to make you happy/No, there's no room to breath". See, our singer knows it will be a lot better off for the other person to figure it out and bail, or else there's just gonna be a ball of hurtin'. Rose, Rose, you're singing chunks of my soul here. Why, she even knew to cover If I Should Fall Behind, one of my favourite songs by one of my long-time collector-obsessions, B. Springsteen. I swear, I don't even know the woman. I love it when that happens.